When it is dark enough to see a few stars in the sky during evening twilight, look to the East and Southeast. About a third of the way from the horizon to the zenith (straight up), 3 bright “stars” can be seen spread out from due East to the South-South-East (see the chart below). View of the East-Southeast sky in the early evening. The star Procyon is located between Mars and Sirius. Chart made with Stellarium. The 3 “stars” are, in fact, 2 stars and a planet: Sirius, Procyon, and Mars. Let’s start with the Sirius, the southernmost and brightest of the three. Not only is Sirius the brightest of the three (at magnitude -1.5), it is the brightest star in the entire night sky. Only the Moon, Venus, Jupiter, and occasionally Mars are brighter. Relative to the Sun, Sirius is twice as massive, has a radius 70% larger, and is 25 times more luminous. Still there are many stars in the sky that are even larger and more luminous than Sirius. The reason for its status as the brightest star in the sky is due more to its relatively close distance than its luminosity. At a distance of 8.6 light years, it is the 5th closest stellar system. Sirius is an A-type star which causes it to shine with a white-blue color. Many times, though, the star will appear to rapidly change color. The reason for this is due to the Earth‘s atmosphere. Turbulence in the atmosphere causes the star’s light to be “bounced” all over the place. The light of the star is made up of many different colors which all “bounce” around differently. As a result, normally blue Sirius can appear to rapidly switch between many different colors when it is close to the horizon (meaning its light is passing through more atmosphere than usual). All stars experience this effect, it is just that Sirius‘ brightness makes it more evident. 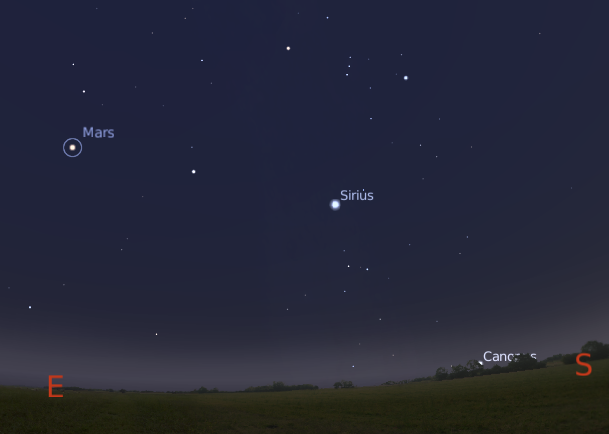 Watching Sirius when low in the sky with a telescope or just your eyes can be one of the best sights in the night sky. Next in line is white Procyon, the seventh brightest star in the sky at magnitude 0.3. Procyon appears fainter than Sirius because it is intrinsically fainter (7.7 times brighter than the Sun versus 25 times brighter for Sirius) and farther away (11.4 light years vs. 8.6 light years). It is also less massive (1.5 times solar mass) but a bit larger (2 times solar radius) than Sirius. The name Procyon comes from Greek and means “before the Dog”. In this case, the “Dog” is Sirius which has long been associated with a dog. Procyon‘s name derives from its slightly more northerly declination which causes it to rise a few minutes before Sirius (at least for northern observers). The final “star” in the line is the red planet Mars. Last month Mars was at its closest and brightest for the year. At the time its brightness almost matched that of Sirius. Unlike Sirius Mars does not appear to twinkle and is a constant red beacon in the East. Why does Sirius twinkle and change colors while Mars does not? Check out Phil Plait’s explanation on his Bad Astronomy site. Jupiter is the brightest “star” in the sky these days. It is located about 30 deg up in the southeast at the end of evening twilight. These days it is setting in the southwest around 3:30 am. Back in August it would still have been up at 6 am. Is the object your seeing still up at 6 am these days? If you have a regular pair of binoculars or a small telescope take a look at it. If it is Jupiter it will appear as a small globe with up to 4 bright moons lined up with it. The bright ‘star’ visible in the eastern sky a few hours before sunrise is Venus. It will be a morning object for the next few months. I saw a very bright star south east very low in the sky about 6.30am and it looks like Procyon, but it’s way too big and bright! Any ideas?? I saw this, too. Could it have been Venus? The bright star in the southeast at dawn is Venus. It is currently as bright as it gets which is many times brighter than any star or the other planets.